Once again, Matthew Turner takes a detailed look at the work put in to translating comic books into comic book movies. Today’s subject is X-Men: Days of Future Past. Warning: This post contains spoilers for X-Men: Days of Future Past and is intended to be read after you have seen the film. In my previous Comics to Screen post on X-Men: First Class, I looked at the challenges faced by filmmakers in bringing what amounted to an X-Men prequel to the screen, both in terms of pandering to two separate fan bases (comics fans and fans of the previous three X-Men movies) and bringing in newcomers. With First Class turning out to be a sizeable hit, the makers of Days of Future Past are clearly less concerned with making things easy for newcomers and, indeed, woe betide anyone coming to see Days of Future Past (hereafter known, clumsily, as DOFP) without having seen a previous X-Men film, as they are likely to be very confused indeed. With that in mind, I’m going to assume for the purposes of this piece that the reader is familiar with the principal players and will instead focus on the challenges involved in adapting a specific and much-loved comics storyline, coupled with the distinct aims of the film within the larger X-Men franchise. The primary objective of DOFP is to link up the casts of the first three X-Men films (Bryan Singer’s X-Men and X-Men 2 and Brett Ratner’s X-Men: Last Stand, of which more later) and Matthew Vaughn’s X-Men: First Class, to which DOFP is essentially a direct sequel. That means the filmmakers (in this case, scriptwriter Simon Kinberg and Bryan Singer, returning as director after a producing role on First Class) have to tailor the pre-existing comics story to fit with the X-Men universe established in First Class and, to a lesser extent, the first three films (or, at any rate, two of them). Naturally, in doing so, they have made some significant changes, as we’ll see below. On top of everything, Wolverine suddenly realised he left the gas on. 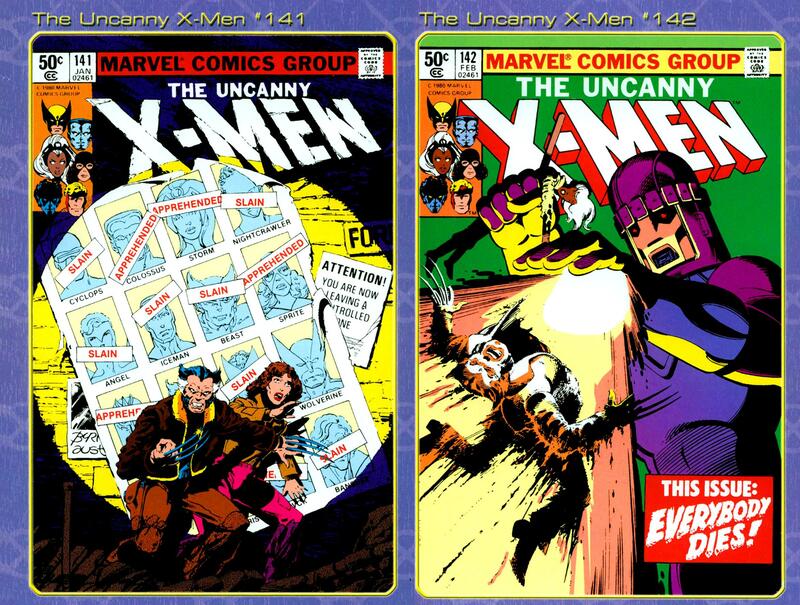 Days of Future Past takes its name from a famous storyline that was co-written by Chris Claremont and artist John Byrne and spanned two issues of The Uncanny X-Men (see picture above) back in 1981. This in itself shows how much comics have changed since then – these days, that same storyline would take place over the course of a year, across multiple X-Men titles. By a rather splendid coincidence, the future part of the original 1981 storyline is actually set in 2013, in a future in which robot Sentinels have hunted mutants into near extinction and the world is on the brink of nuclear war. In the comics, there are only four former X-Men remaining: Logan / Wolverine, Peter / Colossus, Ororo / Storm and Kitty, now Kate Pryde / Sprite. They are joined by a wheelchair-bound Magneto and a new character called Rachel, who has telepathic abilities. (They are also joined by a grown-up Franklin Richards, the son of the Fantastic Four’s Reed Richards and Sue Storm, but let’s not go into that right now, other than to point out that Fox missed a trick by not sticking Franklin in there somewhere, seeing as they hold the rights to the FF too). In the comics, Rachel uses her telepathic powers to switch Kate / Kitty’s mind with that of her younger self in 1980 (confusingly, the story is set in 1980, despite being published in 1981) – it’s explained that Kitty is chosen because her teenage self has not yet been trained to resist a psychic attack. Her job is then to persuade the rest of the X-Men (the class of 1980 includes Professor X, Wolverine, Storm, Colossus, Kitty, teleporting imp Nightcrawler and winged Angel – team leader Cyclops is on leave) that a) she is from a future where almost all the X-Men are dead and b) they have to stop shape-shifting Mystique and the Brotherhood of Evil Mutants previously led by Magneto from assassinating mutant-hating Senator Kelly, an act that eventually fast-tracks the Sentinel program and leads to the future apocalypse. The most obvious change made by the film-makers then – and the one that has caused the most upset amongst fans – is to have fan favourite Wolverine (Hugh Jackman) do the time-travelling with Kitty taking the place of Rachel, who doesn’t appear in the film. The explanation here is that Wolverine ages at a slower rate than everyone else and that his mutant healing ability makes him able to better resist the ravages of time travel, or something. It is not explained how Kitty’s power to phase through solid objects enables her to project people back in time, but no doubt the filmmakers felt they had to have Kitty involved somehow, even if it’s extremely frustrating that they lured Ellen Page back for the role only for her to spend the entire movie holding Wolverine’s head. There is a subtle shift in the line-up too. Colossus (Daniel Cudmore) and Storm (Halle Berry) are present as future survivors, as is Magneto (Ian McKellen), and the film adds Professor X (Patrick Stewart), Iceman (Shawn Ashmore) and various other fan favourites from the comics including teleporting Blink (Fan Bingbing), super-strong Warpath (Twilight’s Booboo Stewart and yes, those are the actor’s names, not the character’s names), fire controlling Sunspot (Adan Canto) and energy-absorbing-and-firing-back-at-you Bishop (Omar Sy), all of whom are previously unseen on screen. Meanwhile, in the 1973 section of the film, the basic plot is more or less the same: Wolverine’s task is to unite old friends-turned-arch enemies Xavier (James McAvoy) and Erik / Magneto (Michael Fassbender), along with remaining X-Man Beast (Nicholas Hoult) so that they can stop Mystique (Jennifer Lawrence) from assassinating scientist Bolivar Trask (Peter Dinklage), the creator of the Sentinel program. Trask, incidentally, is an old-school X-Men villain who made his first appearance in 1965 – he was also played by Bill Duke in X-Men: Last Stand, but that’s not important right now. Mystique also has various members of the Brotherhood of Evil Mutants on her side, including Havok (Lucas Till, reprising his role from First Class), Toad (a redesigned version of the character played by Ray Park in X-Men, here played by Evan Jonigkeit) and biohazard tattoo-sporting Ink (Gregg Lowe), whose power appears to be to make people violently sick. 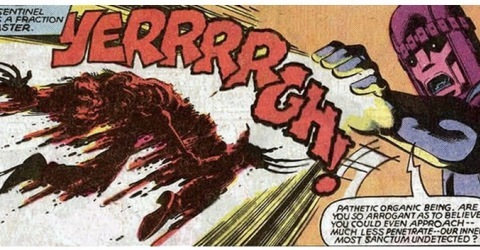 This differs from the line-up of Evil Mutants in the comics, which included immovable Blob (who made an appearance in the first Wolverine spin-off, played by Kevin Durand), fire controlling Pyro (though, in the film it’s the remaining future good guys who have the fire power, so to speak), earth-shaking Avalanche and pre-cog Destiny. Similarly, various other characters introduced in First Class, including Emma Frost, Azazel, Banshee and Angel are all name-checked here as characters killed by Trask in his research on the mutant gene, thereby giving Mystique plenty of motive for his murder (I believe this is called “fridging” in internet circles, but let’s not go there right now). This presumably solves the twin problems of too many characters floating about (something the X-Men universe has always suffered from) and the actors not being available for the sequel, which is a huge shame in the case of both Emma Frost (who has a huge part to play in the later comics, including becoming leader of the X-Men) and Azazel, whose familial relation to both Mystique and Nightcrawler I touched on in the First Class blog. Still, I wouldn’t worry too much about Emma Frost being dead, as a) there’s no evidence (her face doesn’t appear in the autopsy photos Mystique finds) and b) nobody ever stays dead in the X-Men universe for long. I AM A SCARY ROBOT WOOOOO oh wait that’s ghosts. 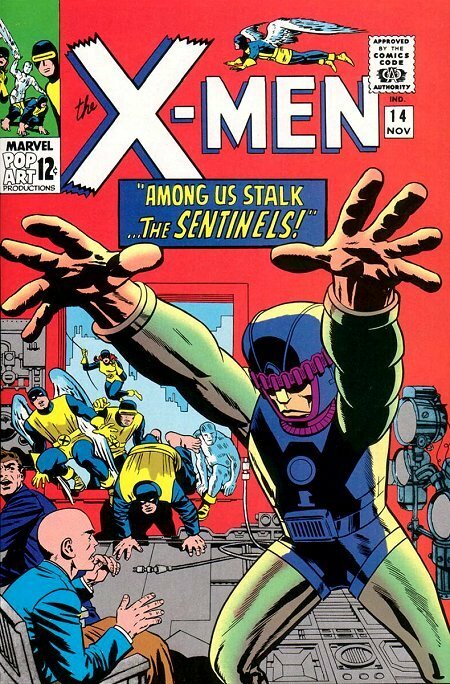 Like Trask, the Sentinels were created by Stan Lee and Jack Kirby and first appeared in issue 14 of X-Men, back in 1965. They have reappeared many times since (search Sentinels on Tumblr for examples) and have even crossed over into other titles to fight, say, The Avengers, though DOFP stands as their most iconic appearance to date. The film changes their make-up slightly and has them as shape-shifting, superpower-adapting robots in the future scenes (as a result of DNA stolen from Mystique, a crucial plot point), but they are still recognisably close to Lee and Kirby’s original designs, largely thanks to whoever’s decision it was to give them a dash of purple in their colour scheme. If you want to get picky, they’re not three stories high and they don’t speak much or even make their rather cute “Squaaaark” noise when attacked, but fans who’ve been awaiting their appearance since the first X-Men movie (though a Sentinel simulation briefly appears in the Danger Room scene in Last Stand) are unlikely to be disappointed. The highlight of DOFP is undoubtedly Evan Peters’ film-stealing appearance as super-fast mutant Quicksilver (essentially Marvel’s version of The Flash), most notably during a terrific set-piece where he leisurely disarms a roomful of guards, altering the mid-air trajectory of bullets, positioning their arms so they’ll knock each other out and so on. It’s such a brilliantly executed scene that you don’t even mind that he appears to be wearing a Sony Walkman (prototype built 1978) in 1973. The film has a lot of fan-pleasing fun with Quicksilver too – the name “Maximoff” on the postbox elicits a laugh of recognition amongst nerds in the audience and there’s a reference to the fact that Magneto was eventually revealed to be Quicksilver’s father in the comics (“My mum knew someone who could do that”). There’s even a brief tease of Quicksilver’s sister, the Scarlet Witch (she’s seen sitting on his lap while he watches TV later). In the comics, they are supposed to be twins, so they’ve tweaked that slightly, perhaps to subtly distinguish them from the characters’ upcoming appearance in Avengers: Age of Ultron, where they have already been referred to as twins, thanks to their appearance in the post-credits sting of Captain America: The Winter Soldier. They’ve also called him Peter instead of Pietro, which seems unnecessary, but there you go. Stryker is where things get rather complicated. Another of X-Men’s classic villains (first appearance 1982), Stryker is best known to audiences as the character played by Brian Cox in X-Men 2, whose aim was to harvest mutants to create weaponry. Short version: he’s eventually responsible for giving Wolverine his metal claws via the Weapon X program (Stryker appears again, played by Danny Huston in Wolverine: Origins, doing exactly that). Cox briefly appears in DOFP in flashback (or rather, flash-forward), because Wolverine meets a younger version of Stryker (Josh Helman), who is working as Trask’s right-hand man. But what’s interesting – and this is where things get spoilery – is that at the end of the film, Mystique appears, disguised as Stryker, and rescues-slash-captures Wolverine, which seems to imply that she will be responsible for the Weapon X program in this new timeline. (There’s even a hint that Magneto is behind this idea, because there’s a line where he suggests to Wolverine that it would be better if his claws were metal). Wolverine, once again failing to penetrate an inner sanctum. And speaking of new timelines, the ending of DOFP, with Wolverine returning into a future where Jean Grey is still alive, clearly indicates that the events of X-Men: Last Stand (in which, spoiler, Wolverine kills Jean) have been completely wiped out. I wonder who had the job of breaking that to Brett Ratner? This is obviously great news for Famke Janssen and it allows the filmmakers to quietly brush aside anything that wasn’t working in Last Stand (i.e. all of it). It’s possible that the two Wolverine spin-offs have also been affected, though it’s possible we’ll never find out, as at this point, Wolverine doesn’t even know his own history, so to speak. In the comics, the consequences of the story were far-reaching, in that the popularity of the story gave rise to many, many more alternate future stories and arguably created the sprawling mess that is X-Men comics continuity today. Amusingly though, the original comic doesn’t even bother telling the audience what happens to the characters in the apocalyptic future – instead, the final panel is Angel saying, “Professor, we saved Senator Kelly, Kitty’s mind has been returned to her body. Does that mean we saved the future?” and Professor X replying, “I do not know, Warren. Cliché as it sounds, only time will tell”. Finally, as has come to be expected with Marvel movies, the film ends with a post-credits sting that teases the next film: X-Men: Apocalypse, which is supposedly going to based on Age of Apocalypse, another classic comics storyline from the 1990s. That said, it’s unlikely the film will follow this synopsis. The obvious worry here is that the plots are rather similar, with yet another alternate future, this time caused by the assassination of Professor X in the past. Still, it makes perfect sense for the filmmakers to attempt this story (or a version of it), since it will again allow them to unite both casts. Will they pull it off? As Professor X would say, cliché as it sounds, only time will tell. This blog post would not have been possible without invaluable assistance from Kim Newman and James Moar.